So my 31 days are up! 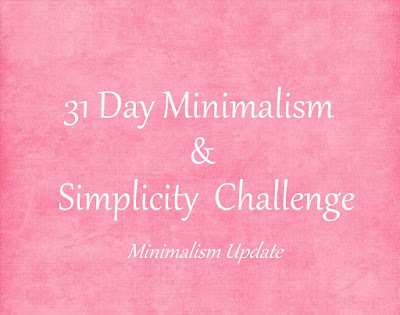 Instead of writing an overview of how I did of all 31 days, I've decided to split this post into two parts, one post concentrating on the minimalism/decluttering days, and one to concentrate on the simplifying days. Otherwise this would be a super long post and I don't think any of us have the energy for that! 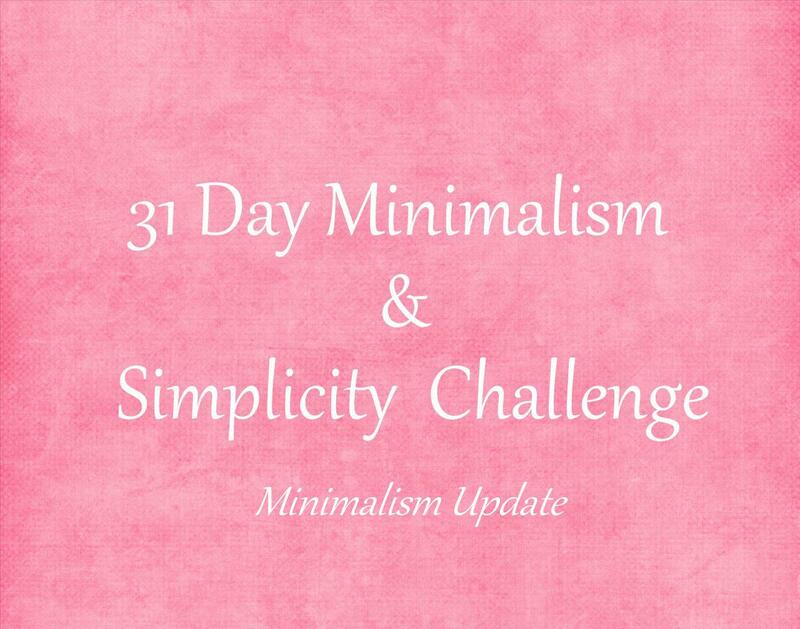 Here's how I did with my minimising! I discovered my sweet tin was full of sweets long forgotten. I had a real sweet tooth while pregnant (haha, when DON'T I have a sweet tooth?) and Mum bought me stacks of lollies and other sweets to enjoy. However, a year later they're still in the tin so it was definitely time to part ways. It feels so so wasteful, but they weren't edible! Okay so I didn't *exactly* manage three items but I feel like chucking away basically a whole tin of sweets makes up for it. I probably would have managed this but a relatively last minute family barbecue happened and I had absolutely no time to declutter! Oops! I totally did not get the chance to do this. I spent all day running around after Charlie, and painting, then all evening blogging. By the time I thought about it, I was ready to sleep. I failed so hard at this. As soon as I saw that this was my challenge today, all I wanted to do was spend money. It's a problem. I ended up buying about five pairs of shoes and a pair of jeans. To be fair, I was in desperate need of shoes AND jeans. I got side tracked by the book I'd been reading the previous day, and totally forgot to check what my challenge was...so, nope. This was hard. I also felt guilty every time I unfollowed a mutual follower. I generally chose accounts that were no longer of interest to me, duplicate accounts (2 or more accounts from same person), didn't have photos I liked or hadn't posted (to grid or stories) in a long time. I probably could have removed a fair few more but I got bored scrolling through to be honest. I mostly just use my personal account to follow and find tattoo artists, but a lot of them aren't particularly close by, and I wouldn't travel for a tattoo unless I had my own car. I don't, so I unfollowed all the artists that aren't in my immediate area. Plus some old school friends whose photos I don't need to see on both Instagram and Facebook. These were 99% just business accounts I only followed for either entering a giveaway, or because they followed me first and I was hoping to get a collab out of it. No shame. Plus someone who had no tweets and I had no recollection of following. I probably could have unfollowed a lot more but, once again, I got bored and I usually just unfollow accounts when necessary, when I see them in my time line. I also deleted 9 numbers from my contacts, of people I never text (mostly Tinder people) plus my midwife, and the midwife who went through my hospital notes with me. I managed to get rid of a rather large tub of Charlie's old clothes, a stuffed unicorn and 3 lots of wrapping paper that Charlie had ripped to shreds. I think I win. I had 20 boards and 2,513 pins. Which is actually a lot less than I thought! Considering I feel like I'm pinning constantly, I thought I'd have more like 10,000 pins. But, it was time to let some go. I decided to delete four boards outright: journaling, tattoo inspiration, blogging inspiration and business tips. None of these are things I'm currently interested in, and three out of four were private boards anyway. I did consider deleting my Bullet Journal Inspo board but I just couldn't bear to part ways with it. The next thing I noticed is that I had a lot of duplicate pins that were just unnecessary. So off they went, deleting the oldest of the two+ pins. I had the same pin 3 times on one board! This took me down to 2,484. I thought it would be less than that to be honest! After that, I just deleted the pins that no longer interested me, and also started organising the pins (in some boards) as I went through them. Something I noticed while going through my Killer Outfits board was that I deleted a majority of my grunge/goth/alt. outfits, and that really just goes to show how much my personal style has changed lately! When I moved onto my Makeup & Nails board, I decided to organise them before I started deleting, and while I was organising I could see tons of duplicates, and nail styles I definitely wasn't into anymore. I actually had almost 300 nail pins, but by the time I'd finished, I had just 100. Phew! As for makeup, I started with 117, and ended with 84. All of which look very much the same to me, but nevermind. After about 3 hours of going through the boards one at a time, I decided to go through the 'pins' section and do it that way. I swear I saw and deleted the same pins a million times, I was getting quite fed up with it! I deleted a few more nail looks but I think my Hair Envy board had the most removed. I decided to take out most of the blue/green coloured hair, as a reminder to not be tempted by blue again, and then deleted any other hair cuts/colours that didn't immediately make me go 'WANT!'. I did actually consider deleting the hair board several times but there were some pins I just didn't want to lose. Next, I tackled my Minimalism & Simplicity board. It took a bloody long time but I deleted duplicates, multiple articles that pretty much all said the same thing and I created a few sections so that visitors (and myself) may find what they're looking for quickly and easily. By the time I'd finished with it, it was gone 3am and I still had four boards to go through. I already knew that two of them would be deleted by July, and I was just too tired to deal with any more. Seven hours later, I was down to 16 boards, and 1,320 pins. Wow. If only I could declutter actual, physical items that quickly and easily. I actually completely forgot about my challenge but I did manage to throw away another nail varnish and a sticker. 2/3 ain't bad right? I actually managed to fill a charity bag with a bunch more of Charlie's clothes and a tapestry that I bought about 5-6 years ago and haven't had on display for about a year. I also added two more items to Shpock but haven't sold them yet. Bonus decluttering: the same night I decluttered my pinterest boards I also deleted 32 people from Facebook. I could have deleted many more but it just seems really harsh on certain people. But then if we're not interacting with each other, then what's the point? Honestly, I'm tempted to delete the whole thing but it's the only way some family members see Charlie regularly. But really, why should I care? I ALSO got rid of 8 bags worth of clothes and bric a brac, which all went to the charity shop. So at the end of this challenge I should have got rid of 27 physical items from my bedroom. It was actually more like 200+! Isn't it amazing how much stuff you accumulate! I need to go through all mine, I'm to fat for most of my clothes . . . . .